Designed for high resolution imaging such as confocal microscopy. 6 well glass bottom plates are often used in experiments that need medium to large sample size. * Click individual products to view detailed technical specs. request a free sample or get a quote. 6 well plate frames are made from virgin polystyrene. 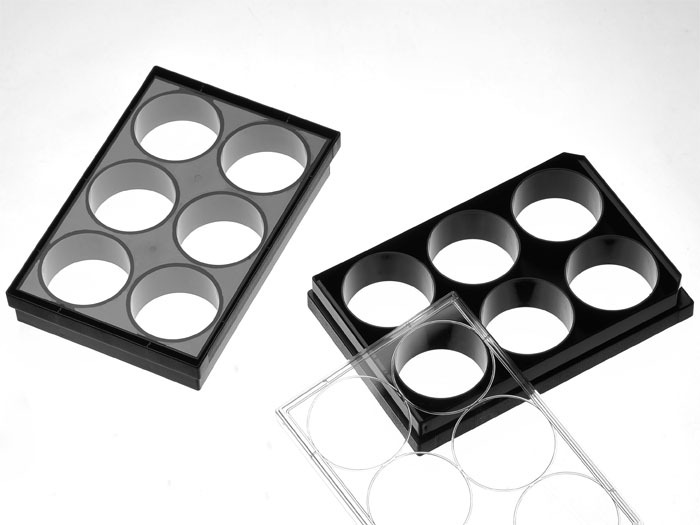 A USP class VI adhesive is used to assemble the cover glass and the plate. Quote: "Slices 285 were then transferred to membrane inserts (PICMORG50; Millipore), which were placed in 286 glass-bottomed six-well plates (P06-1.5HN, CellVis)." Quote: "Briefly, dissociated neurons from rat hippocampus or cortex were seeded onto poly-l-lysine-coated (Sigma-Aldrich) coverslips in 60 mm dishes, each containing five coverslips, six-well plates, or glass-bottom six-well plates (In Vitro Scientific)"
Quote: "The astrocyte-containing cell culture inserts were then transferred to Poly-D-Lysine coated 6 well high precision (1.5H) glass bottom plates (In Vitro Scientific)"
Quote: "TopoChips were mounted onto glass 6-well plates (Cellvis) with ProLong Gold anti-fade reagent (Thermo Fisher Scientific). Images (20x objective) were acquired on"
Quote: "Recording pipettes (4–8 MΩ) were pulled from borosilicate glass with an outer diameter of 1.5 mm using a P-1000 flaming/brown horizontal micropipette puller (Sutter … P06-1.5HN, In Vitro Scientific, Sunnyvale, CA, USA)"
Quote: "Expanded gels containing embryos were imaged in 6-well glass bottom plates (Cellvis, Mountain View, California, USA) using a Zeiss LSM 800 confocal microscope"
Quote: "Seeded scaffolds were transferred into 6-well glass-bottom cell culture dishes (In Vitro Scientific, Sunnyvale, CA) with media changes"
Quote: "Recording pipettes (4-8 MΩ) were pulled from borosilicate glass with an outer diameter of 1.5 mm using a P-1000 flaming/brown horizontal micropipette puller (Sutter ... P06-1.5HN, In Vitro Scientific, Sunnyvale, CA)"
View all 21 publications citing "6 Well glass bottom plates"